Ok, I hit my un-official goal of 286 on Dec 28th. I had to do a work survey, and picked up a Snowy Owl north of Guelph in the afternoon. Why is this so much fun? Well, to recap, every single year I've been birding, I've seen more species the previous year than the last. 2009 was 285. 2008 was 282 (in Ontario). Which is all fun and games, but also consider that I was in Newfoundland for almost all of January and February! And I ended up having one of my worst "May" periods of my birding career, seemingly missing "regular" species at every turn. By June 15th, I knew there was no chance to repeat 2009's totals. 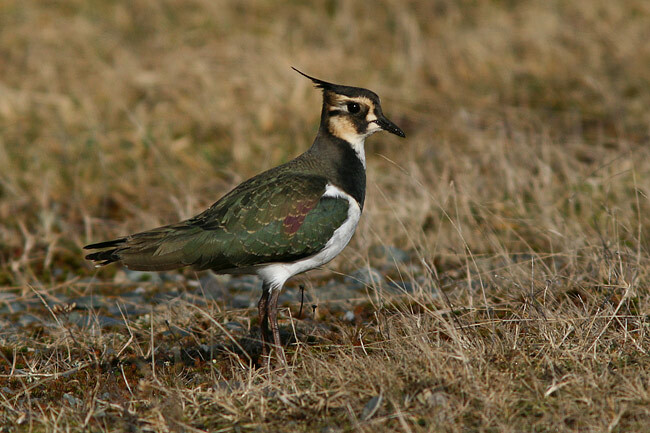 Not only because of the poor start to 2010, but also the fact that 2009 was an amazing birding year for me. (and I don't really chase birds, so this isn't a result of driving more kilometers to get a higher list)... Anyways - I think everyone gets the point, so I won't talk about this again until next December. Another year in review fact: I mentioned a week or two ago about Ken Burrells drive to get 300 species in Ontario for the first time - and he reached his goal with some Bohemian Waxwings on Christmas day. Congrats to Ken! Click for a bigger image. Above: on left, adult Great Black-backed X Herring Gull hybrid. 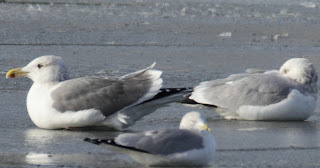 With Ring-billed Gull (middle) and Herring Gull (right). Note the large GBBG-ish size with mantle intermediate between parent species. Juv. Thayer's Gull on the control gates wall - Niagara Falls, with adult Herrings below. View from Adam Beck. Note the gulls in the above photo. 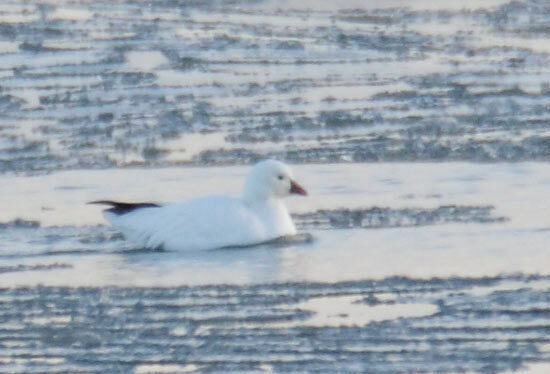 At dusk there were 10/15 Iceland, 3+ Glaucous, 2 Thayer's Gulls, 3 Lesser Black-backed, 1 Herring x Great Black-back, and 1 Herring X Lesser Black-backed gulls hanging around at Adam Beck. Earlier in the day I had encountered a strange feeding swarm of Large white-headed Gulls, and mallards. See the Juv. 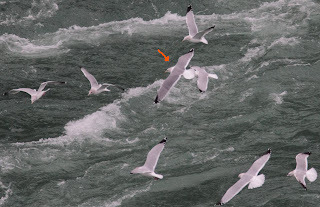 Iceland Gull in the above photo for an example. It was a tight swarm, close to the side of the road, so I watched from the car! 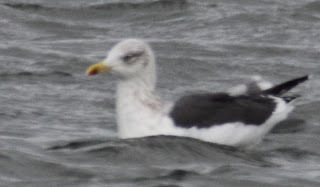 Turning up the Iceland, a Lesser Black-back, and a few Glaucous (see below). Strange bunch! 2nd basic Glaucous Gull from the above swarm. 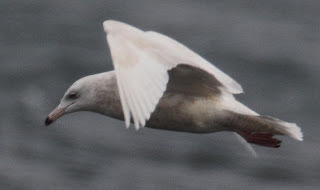 Glaucous Gulls had clearly "arrived" recently, with 7 birds seen in my limited stops on the river. Adult Lesser Black-backed Gull added for good measure. Plan on returning to the river sometime soon... 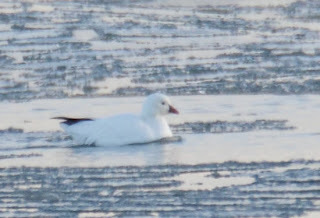 I don't understand why every time I go to the river, I see more hybrid and uncommon gulls than most other people, but rarely seem to find the true rarities like California, Slaty-backed, Mew etc etc ??? Ok, now I have to go do some sort of "real" work! Redwings are replacing Fieldfares in range - and there has been a big increase in North American records to follow this change! There were 3 (I think 3?) records of Fieldfare in Ontario before the switch - so it's time to learn Redwing! Be ready for it!!! Anyone going to Newfoundland for the holidays? Maybe Bonavista? Terrible winter weather is hitting the UK, and now a killer Nor'easter is going to tear into newfoundland for the next few days. Birds just have to fly 1/4 of the way over the ocean before getting sucked into the powerful winds. Will it bring anything? Well you never know with these storms. Sometimes they're a total dud, but the opposite is also true - crazy birding events don't often occur without crazy weather! Keep an eye on that surfbirds rarity gallery! Well after all my hot-air yesterday about sitting at 284 for the year - I had a days worth of field work in prime Snowy Owl habitat. 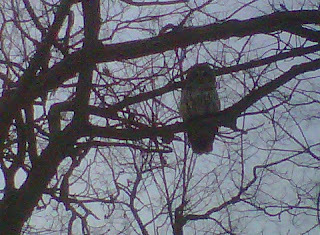 Snowy Owls had been reported recently north of Toronto, north of Guelph, and New York. - Guaranteed Snowy Owl... Right?! They've finally arrived?! Long day of searching, but nothing. Ok - the next plan - start searching random clumps of white pine for Long-eared Owls (another i'm missing). Searched far and wide, on public and private property, on.. well never mind. There weren't any Long-eared Owls either. The sun set on another day.. 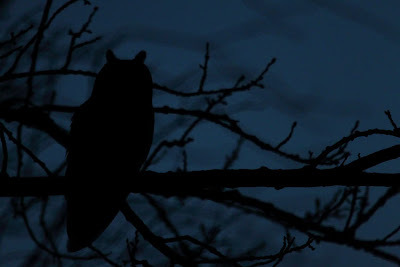 Dark, and no luck on getting my owls. But what is that? Just when you think the day is over, something great like that happens. Awesome end to the day. Wait, what is that? Ok, so it's not the Snowy Owl I was searching for, the Long-ear was enough. But it's still an awesome sight. 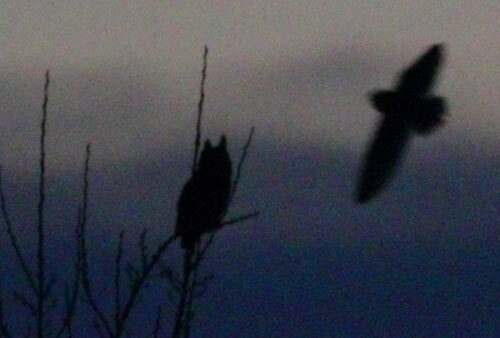 We had a Short-eared Owl attacking a Great-horned Owl - long after the sun had gone down!!! I pushed the camera's ability here, but was really happy to at least have some sort of documentation of the scene. - A Short-eared Owl dive-bombing a Great-horned Owl. 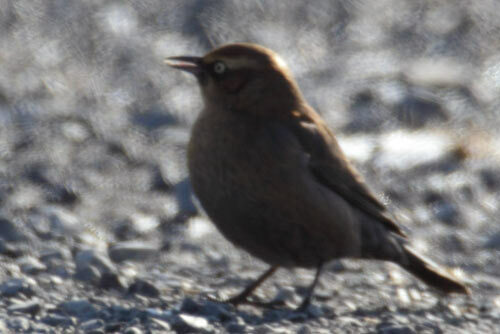 white-throated x white-crowned sparrow hybrid? Back to taking pictures with my phone! I don't have my pre-2006 info on me, but every single year (since I started birding) - I've seen more species than the previous year. Every time! I've never done a "big year" - this just seems to be an example of my growing knowledge about birding and birds in Ontario. I really thought this year would be the one to break the trend. I spent the first 2 months of the year in Newfoundland. 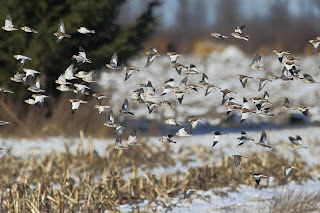 I really didn't see any birds in Ontario until late March. Then my spring migration was the worst I've had in years. I was birding every day in May, and managed to miss several Warblers like Cerulean, Chat, Prairie, Kentucky, Yellow-throated, Connecticut, Prothonotary - just to name SEVEN. All this, combined with the fact that I had an AWESOME birding year in 2009 (Black-tailed Gull, Black Swift etc!) - gave me little hope of passing my 2009 total of 285. And yet, here I sit now at 284?! Will I get to 286? To pass last years total? Well I know there are still some pretty easy species to get - like Snowy Owl and Long-eared Owl (yes, I'm still missing these birds). Not to mention a few long-staying rarities in Ontario. Keep tuned in for the next 10+ days! I'll see if I can get to 286 without needing to chase anything (im not much of a chaser). woo! I'm just starting to think about having spare time, which means it is time to do some work on the website - and get it back online! But I have one quick question - how does the above photo look on your computer? (Click to see large version). I'm contemplating doing different things for the site, including larger photos. Is the 1000pixel image above too big? Does it look ok? If you have a minute, leave a comment below or send me an email! I just need 5 words of less! And it will go a long way towards some new ideas that could be a part of my new website. Thanks! Hope everyone has a good holiday season. 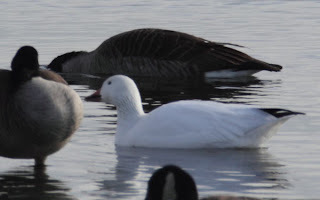 The two Ross's Geese seen yesterday near Erieau by Ken Burrell and myself. Been hanging around the area for a while! Some of the area near Rondeau, and also western lake Erie - is starting to freeze! Some years we're wondering if there will be any snow for Christmas - not this year! seen at www.UPBirders.org in the 2010 photo gallery. What crazy birds! Not sure what the weekend holds bird-wise for me.... Maybe won't be until after the weekend that I start seeing things again. 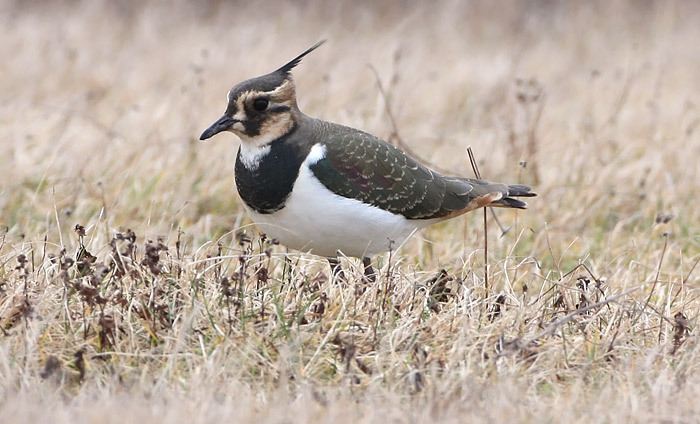 Will end today off with another stellar photo of a Northern Lapwing in Newfoundland. This time by Jared Clarke. Dynamite! I had one of those funny days at work, 6/7 hours of driving for 1 hour of work... So I took advantage of it to do a little extra curricular birding in the Point Pelee area. Bumped into Ken Burrell, who is working on getting 300 species in Ontario this year on his list! Pelee was, well, Pelee. We did some casual birding, and turned up tons of species you wouldn't easily see elsewhere in Ontario. Below is our ebird checklist for the whole area. We checked Wheatley, roads to the park, the national park, then a final check of Wheatley. The birds:!!! Great Blue Heron 1 - at the tip of all places, on rocks/ice. Hermit Thrush 20 - everywhere in the park! Yellow-rumped Warbler 1 - what winter? Not bad! 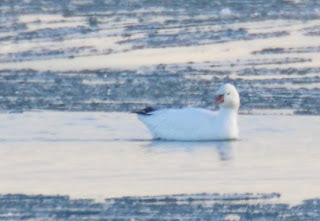 We also did a quick check of the Rondeau area, which didn't turn up much else of note, other than 2 Ross's Geese. We had heard reports of these birds a while ago? But had no idea they were still around. An unknown twitch if you will. 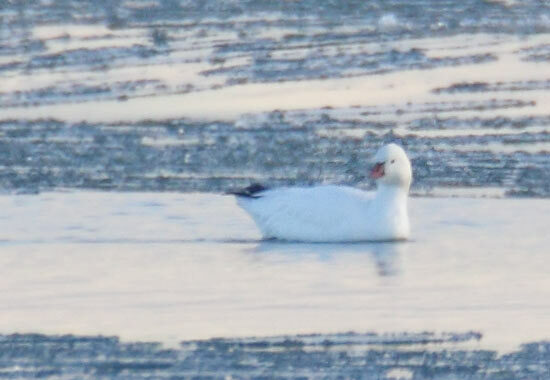 I have some distant pictures of the Geese, which I'll hopefully post later tonight! Spent a few hours at Fifty Point C.A. doing some lakewatching Monday. Very cold and windy, which made for poor viewing conditions (shimmer). In hopes turning up something, I headed for the river around 11am, and checked several spots (no check of queenston though). What did I find? What you'd probably expect. 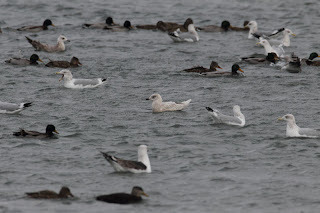 Little, Lesser Black-backed, Iceland and Thayer's Gulls. You'd almost think it was mid December. One or two Ross's Gulls were found in Michigan today. First state record(s). Going to have to keep looking! Anyone cheering for GSP last night? I watched it today. Hit Van Wagner's Beach, in hopes of the forecasted 25knot east winds. What did my Dad, Kevin McLaughlin and myself have? 5km SE winds. We had a few Common and Red-throated Loons, and that's all she wrote. Might try the lake again tomorrow. I'm still keeping my eye on the James Bay Ice maps, and the north winds we've been having. 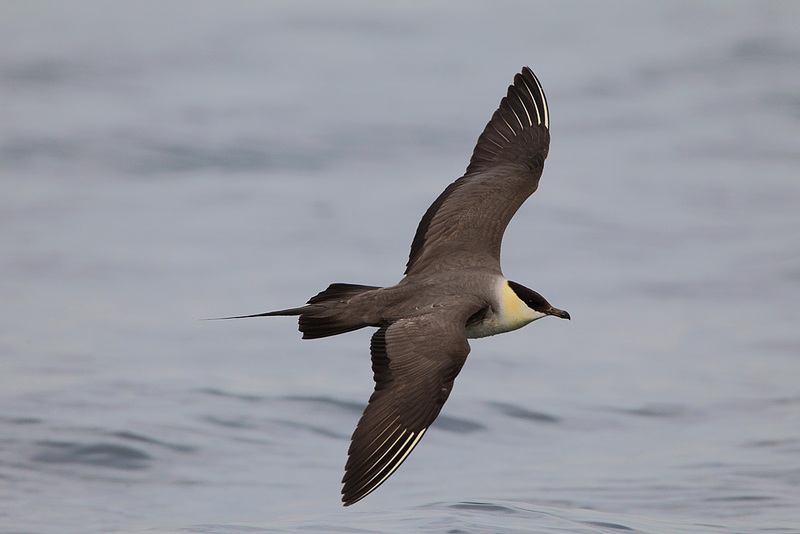 Will any late-season pelagics turn up? There's a pretty crazy jet-stream right now. Note: these photos will move down the page as new ones are added, so check soon! What's next Kirk? Heading to NL for some of their rarities? Cheryl Edgecombe of Hamilton went today and saw 2 Northern Lapwinds. 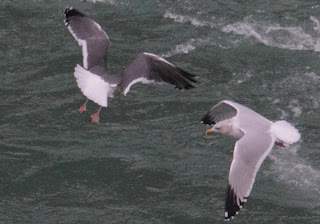 There's also Yellow-legged, Slaty-backed and Black-tailed Gulls in town, for some extra fun. - Bruce Mactavish photo, a few days ago. Well I didn't get out much, but I did see some birds. Yesterday Jenn and I found our way to the Niagara birding area, and had some highlights. My favourite was great looks at a Northern Saw-whet Owl (that Jenn found), which was the first I'd seen since last year. Jenn's self-professed bird of the day was a cooperative Tufted Titmouse. We spent a few hours looking around at the river, highlighted by the expected gulls. 3 Thayer's Gulls at Adam Beck (good looks too!). 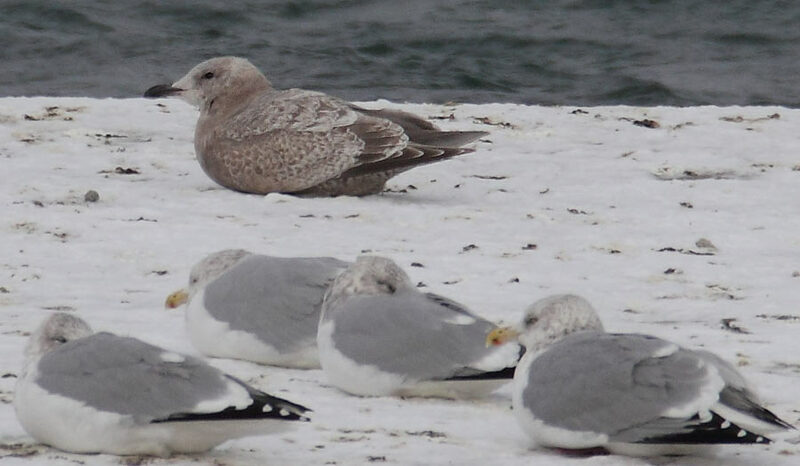 4 Lesser Black-backed Gulls (mainly Adam Beck). 1 Leucistic adult Herring Gull (Adam Beck) - funny lookin brown/white bird..
Had a Rusty Blackbird staying with a flock of Mourning Doves. Decent winter bird, and strange behaviour. 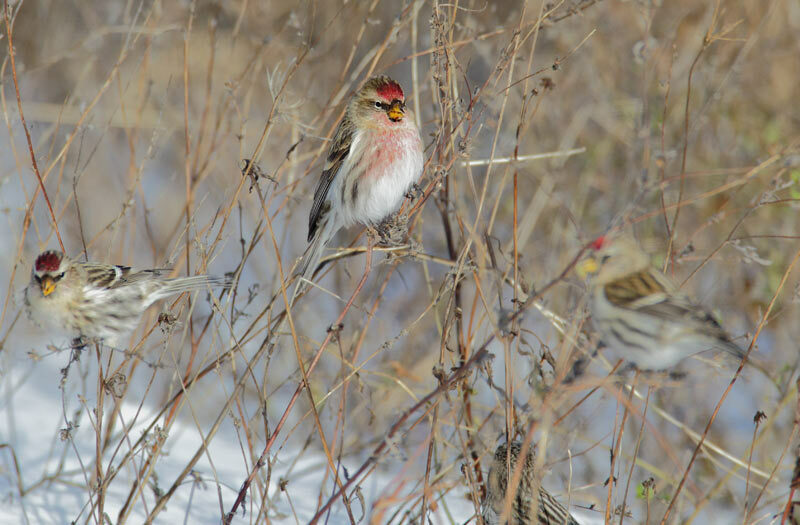 oh, and I also had some Redpolls. Just like everyone else. We get it. 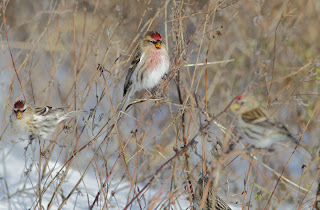 Redpolls are moving into southern Ontario. We get it. seriously. just stop. please. Looking forward to this large "winter storm" arriving late Saturday/Sunday. Keep an eye on current forecasts, and follow all pre/post storm protocols for storm birding. I know I will be. My Dad and I went to Fifty Point in Grimsby this morning for some good old lake-watching. There was a steady movement of birds, but no real highlights, until we had an adult male King Eider fly west with a White-winged Scoter. A rare plumage for southern Ontario! The time has come to end off the Netitishi daily postings. Notes: Huge deep freeze. -19 at dawn. Light and variable S winds, turning to SE and increasing ESE at dusk. Blows E or NE all night before switching to poor W winds at dawn the next day! Boo! Notes: Wind strong N at dawn, then heavy snowsquals after 90mins, wind switches to strong WNW or W (80+kmh). Temps drop and shimmer returns to water. Fully sunny by the evening. Ice on shore holding, despite big waves. Purple Sandpiper 1 - flying over the ice! and that's all I wrote! Ever check your local weather, only to find a photo of a rare bird staring back at you? A Common Teal (aka Eurasian Green-winged Teal) about 5/10 minutes from my parents new house in Burlington. My Dad and I found a Common Teal at Point Pelee in May a few years ago, for my only sighting in Ontario. Probably hugely overlooked in the province. The Brits have actually split them into separate species, but not here (yet). My trip to Newfoundland last year provided me with several more birds to observe, and after spending most of a day in a muddy creek bed, I actually managed some nice photos there. A few more daily lists on your way! Seals are still providing a lot of talking points behind the scenes. I'll be posting a summary soon, but are there any last comments on ID before I let a new cat out of the bag? I'm pretty interested in the weather over the next 4-ish days. Interested enough to actually get out of bed early the next few days - and then actually do some birding! Very high hopes of some good birds to report very soon. 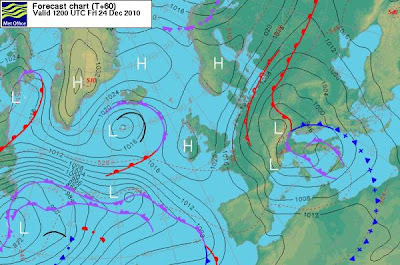 Notes: Light winds, variable SW to SE, sometimes calm. Light snow on ground. 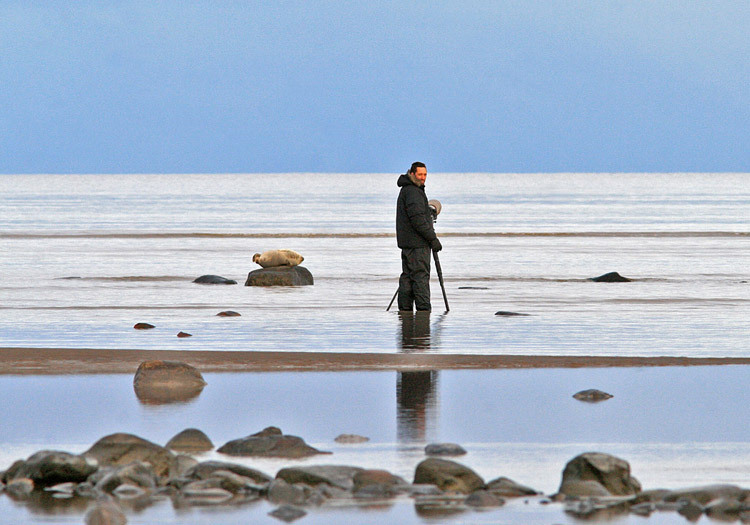 10-15 seals seen during the day. Notes: Modest NE eventually becoming stronger NW late. Wind blows NW all night, then West by dawn. boo! Temps around freezing all day. Notes: Very windy. W up to 80kmh? Cold temps - below freezing all day. -4/-5. Shimmer on the water was terrible. Clearing in the evening, with rapidly falling temps. Me with a seal on Nov 16th. I actually got a lot closer over the next hour, and was taking headshots! Photo by Alan Wormington. I've got high hopes on following up on the Seal ID, Sooty vs Short-tailed Shearwater and more in the next few days (maybe a week). But for now, I'll continue on the daily seawatch counts from Netitishi! Why? Because it's easy. Notes: Sooty Shearwater seen just after the passage of a weak front, on stronger WNW winds. Notes: Forgot to note weather. Varied Thrush not actually confirmed until next day, but heard this day. The large number of November shorebirds was CRAZY. They all looked really fat (round), and obviously different than how we usually see them in southern Ontario. We assumed these birds MUST fly to the gulf coast or further when they leave James Bay.